When you need to organize something, is your first thought to head out to the store to purchase new storage containers? Or are you like me and scavenge odds and ends around the house to use instead? I’ve been sorting through my stamp area and office recently and so have been thinking about this a lot lately. I’m the kind of person who gives product packaging a good look before I throw it away or put it in the recycle bin. Sometimes trash is just trash. But many times it can be re-purposed in a way that can be very useful and save you money at the same time. 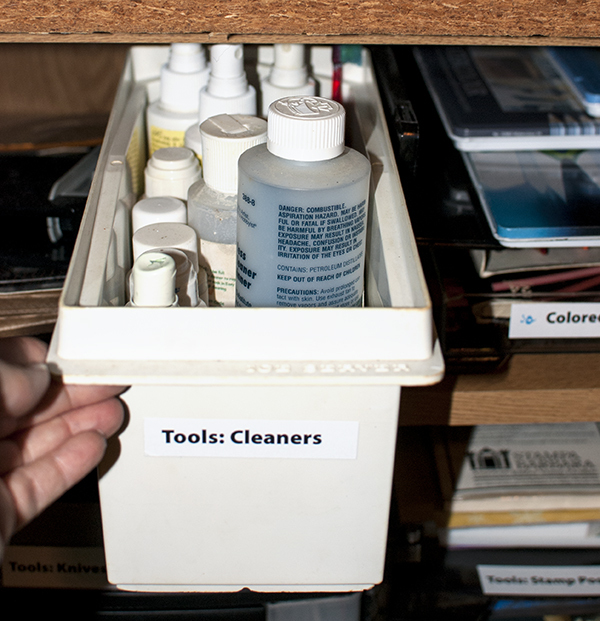 Here are some of the ways that I use “trash” for storage in my stamp area . . . and a few other places. Take home containers from local restaurants vary from pretty flimsy to surprisingly sturdy and too good to throw out. In our house, most of these get used for holding left-overs in the fridge (instead of purchasing new food storage containers for the purpose.) 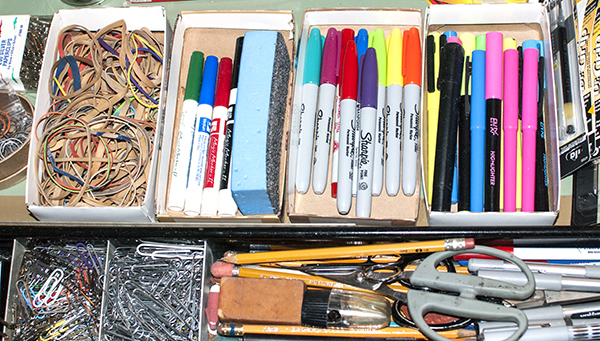 The nicer heavier ones can also be used to divide items in drawers similarly to shallow boxes and lids. Often they are stackable so you could use them to store smaller quantities of stamp related supplies and stack them on a shelf. They can also be handy for holding water for use when painting. Especially large but shallow ones can even be used for projects like shaving cream marbling. 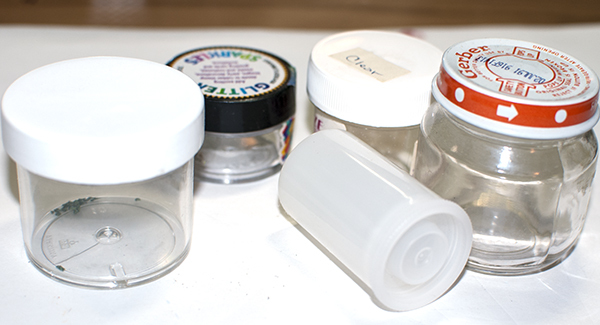 The lids on these things can be used as palettes for ink or paint. Speaking of palettes, I used to get the kind of individual yogurt that had an extra plastic lid over the foil. (They’ve since eliminated the extra lid.) They made great mini palettes for mixing small quantities, using one color or when you need a puddle of glue for a project. I liked that I could use them once and not have to clean them. (Some paints, like acrylics, are better not going down the drain.) 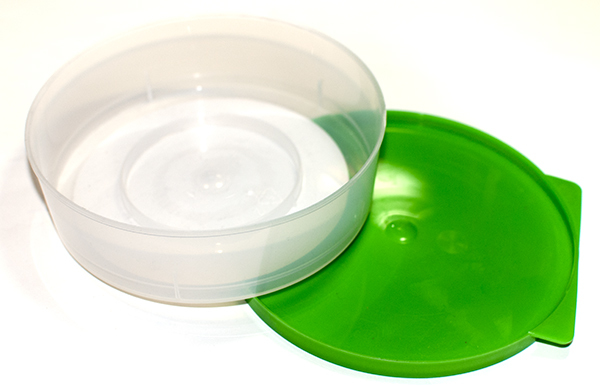 Other product containers have similarly sized flat plastic lids that can be used the same way. I love canning jars. This time of year it is usually easy to find them and they aren’t nearly as expensive as a lot of storage containers. Some spaghetti sauce comes in jars that look like canning jars; remove the label and wash it out and you don’t even have to buy an extra jar for storage. These can be handy for holding things like paintbrushes, markers that you want to stand up and tools like burnishers, etc. Small jars have their uses too. When I use up the contents of small jars of embossing powder, glitter, etc., I save them for future use in the craft room. 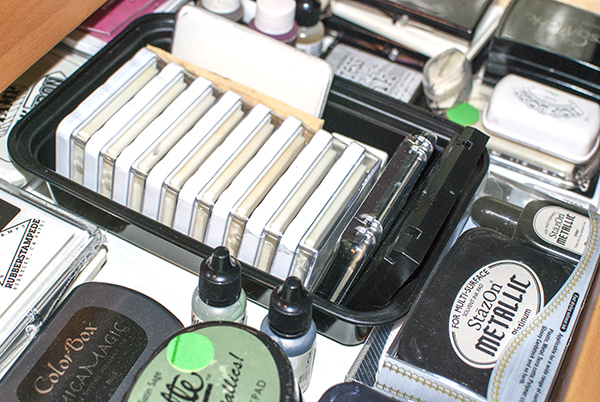 They can be handy for storing custom mixes of embossing powders or powdered pigments. 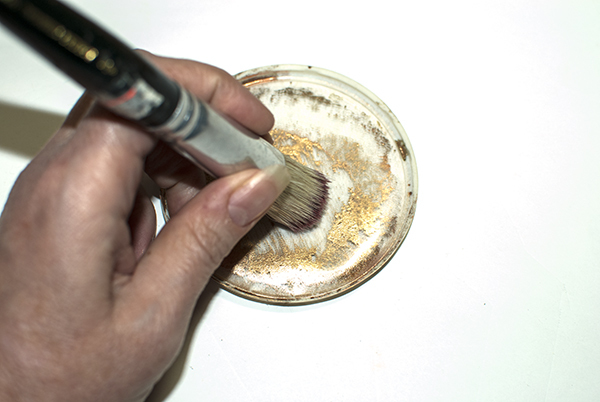 You can also use them to hold small amounts of paint or water. Baby food jars or film containers (if you still have some of these around) can also be used in these ways. The old ice bin from an old refrigerator, which is a nice deep but fairly narrow open container, holds my stamp cleaning supplies. (See “My Stamping Work Space” blog post.) I saw similarly sized plastic bins for sale in the local craft store today. Why buy one when you can re-use something else? Blank CDs and DVDs sold in bulk typically come sitting on a circular disk of heavy plastic with a spindle to hold the CDs or DVDs and a plastic cover like a column to cover the whole thing. 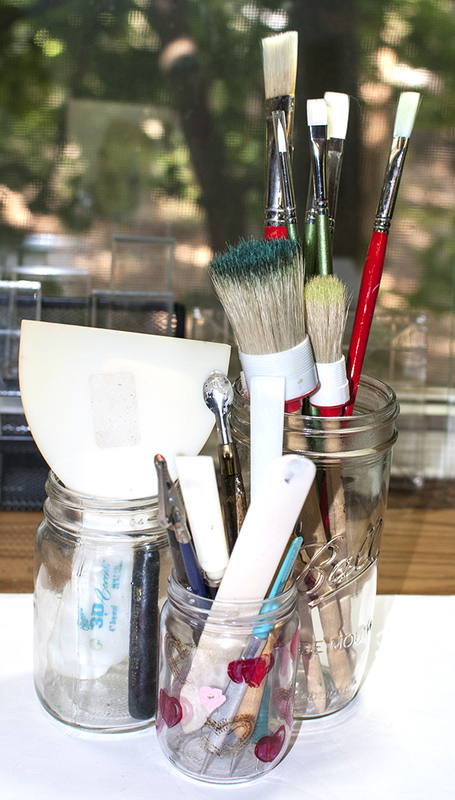 When you are have used them all, the plastic cover can be flipped over to hold markers or paintbrushes, etc. Sometimes there are extra clear plastic disks inside that can be used as mini palettes. 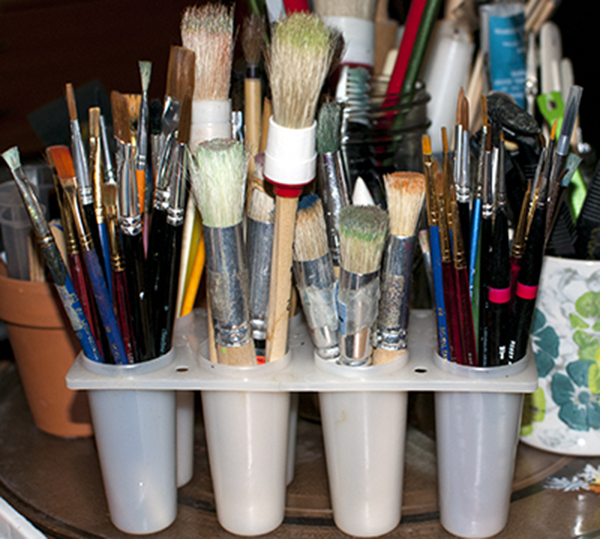 I showed you my paintbrush storage in the “Keeping Stamping Supplies Close” blog post. Sometimes you can’t find what you want in stores but find something that will work lurking in the back of a closest, like this popsicle mold. Individual yogurt cups are handy for mixing up small quantities of paint or holding just a little bit of water. 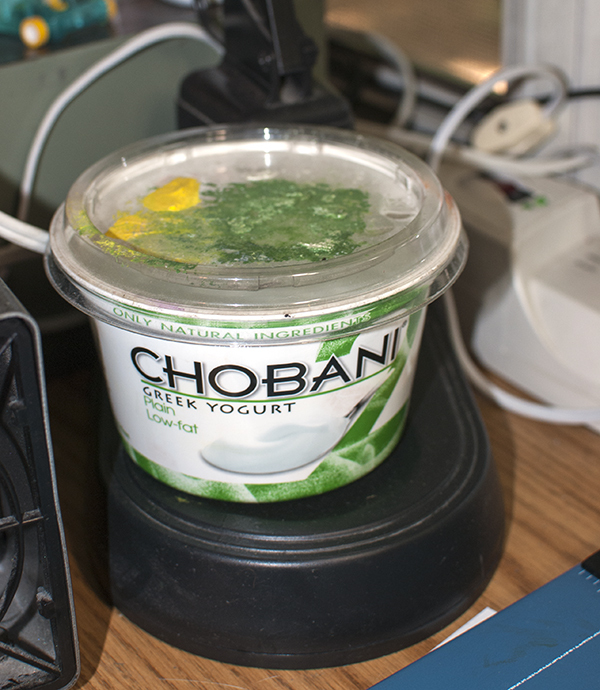 I keep this larger yogurt container in my work area filled with water. The lid keeps things dry and tidy and I’ve always got some water if I need it. 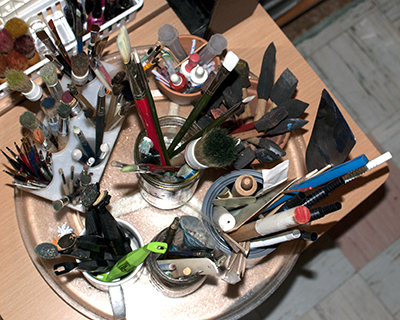 As you can see, I once used the lid as a quick handy palette for acrylic paint. Now that my kids are grown and don’t need to make bag lunches anymore, I don’t buy plastic silverware very often. 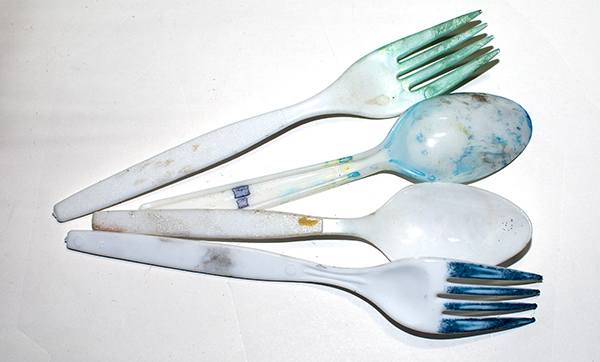 But sometimes when you get carryout, you’ll get a little pack with a spoon, fork and knife. If we eat at home, they really aren’t needed, so I put them in a box in my stamping area. They can be handy for stirring things or spooning out paint from a jar. Similarly, you sometimes get cheap chopsticks with carryout. They can be great for stirring things or lifting just a little bit of paint out of a jar. They can also be handy for holding shrink plastic or a card down on a work surface while you use a hot heat-tool on it. It seems like everything comes in plastic these days. 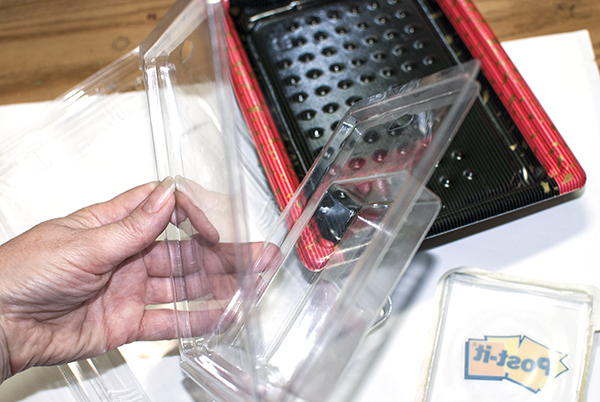 Sometimes the heavy clear plastic is molded to fit the product and the indentations can be used as a palette. 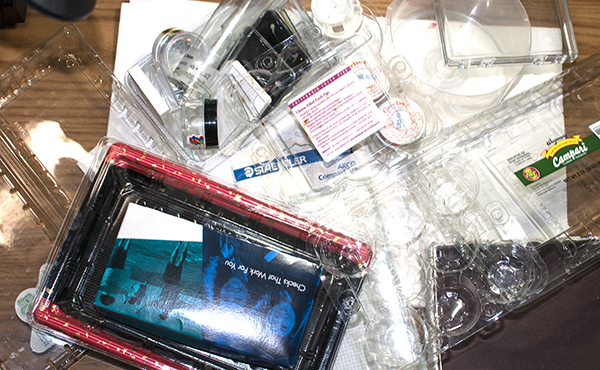 Other times you’ll find broad areas of clear plastic that can be saved for use as card “windows”. Produce containers can be particularly interesting. Often things like strawberries or blueberries and other fruit comes in clear lidded containers that can be cleaned up and the labels removed and then used for storage. They typically aren’t as heavy weight as purchased storage containers, often have holes for air circulation and probably won’t last as long, but when you need a new one, you just salvage one from your next fruit purchase. You don’t see fresh figs in the grocery store very often. I picked up a pack of eight recently as a special treat. The package (center of photo above) had a little nest for each fig. Looks like a paint palette to me! The last time we painted our walls, we purchased many rolls of Frog Tape (a type of masking tape for painting.) It came in this packaging. I haven’t used them yet, but they were too good to toss. They could hold water or paint and might work for storing other things. Often I’ll save things even if I don’t have a specific use, knowing that at some point they’ll come in handy. In my house, glasses and ceramic mugs don’t last long. We seem to steadily break or chip them and periodically I need to pick up another inexpensive box of glasses or mugs from Target. This sometimes leaves odds and ends of glasses, and particularly mugs, that don’t match anything. I’ve also had a few mugs that I really like, lose their handles. 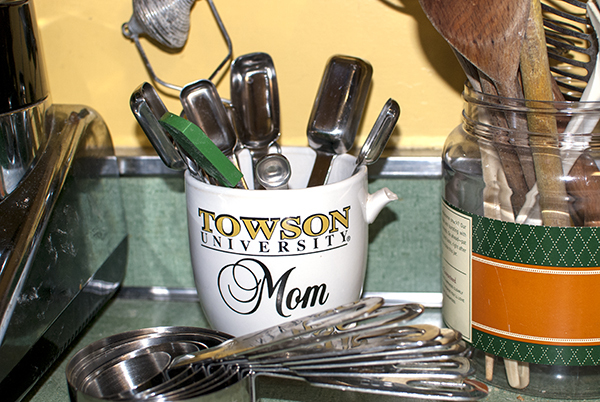 If I can’t bear to toss them, I use them for storage, like this mug that holds my measuring spoons in the kitchen. 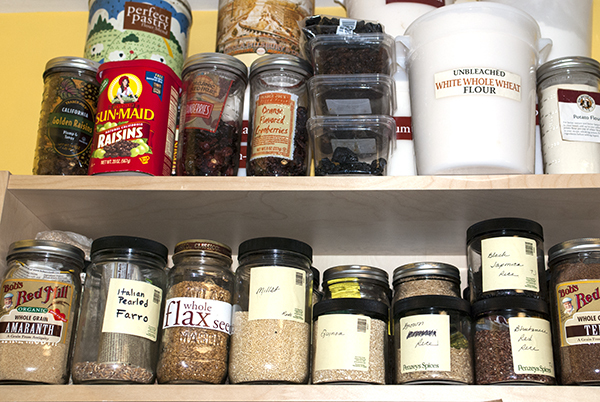 As you can see, I’m also using a plastic trail mix container (we eat tons of the stuff) for storing kitchen spoons, etc. One of these days, I’m going to create a beautiful stamped label to cover the original product label. While not really candidates for storage use, things like decorative store shopping bags, old calendars and discarded but still nice gift wrap are all things that could be given a second life as a handmade envelope, the cover of a handmade book or a background layer for a card. (See “Making Easy Envelopes With a Template” post. And sometimes junk mail has interesting bits or pictures that can be salvaged for use in a future project or has clever card constructions to inspire future cards. 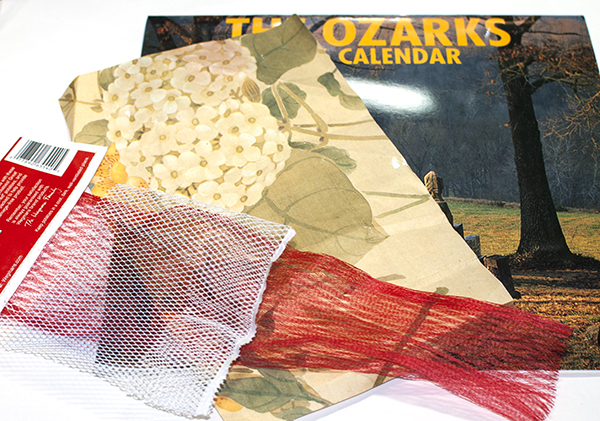 Even mesh produce bags could turn into an interesting textural card layer. We stampers are pretty resourceful people. I’ll bet you’ve used some of these same things in similar ways and maybe have found other ways to use this trash (I mean “treasure“) in the stamp room. It keeps this stuff out of the landfill (at least a little longer) and saves money. What kinds of treasures have you rescued from the trash to use in the stamp room? Love this Nancy, Hey did you know that some of the plastics you showed can be also used as shrink plastic? 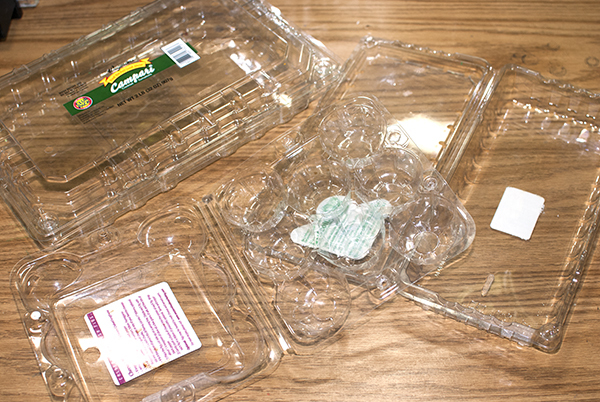 #6 plastic is often what the strawberry plastic containers and the new squat Yoplait tubs. It works! I often shop and think about the packaging of the products I choose, Some fat deli products like hummus and cold cuts are in shallow stack-able containers perfect for storing embossing powder, it is handier to store EP like this with a baby spoon (yep, had a lot of those around after the twins hee hee) so when it is time to emboss you can hold the card over the tub of powder, spoon it on your card and let the excess fall back in the tub, way easier than dealing with little jars for your most often used colors! I have another use for the plastic clear CDs, use them to like up clear alpha stamps when you want a curved title or bend a long stamp on a curve as you have the edge of the CD to guide you. Oh! I got 3 bottles of wine on year for Christmas and it came in a dived wood box perfect to store my embossing folders and texture plates, I just flip though and see my whole collection! 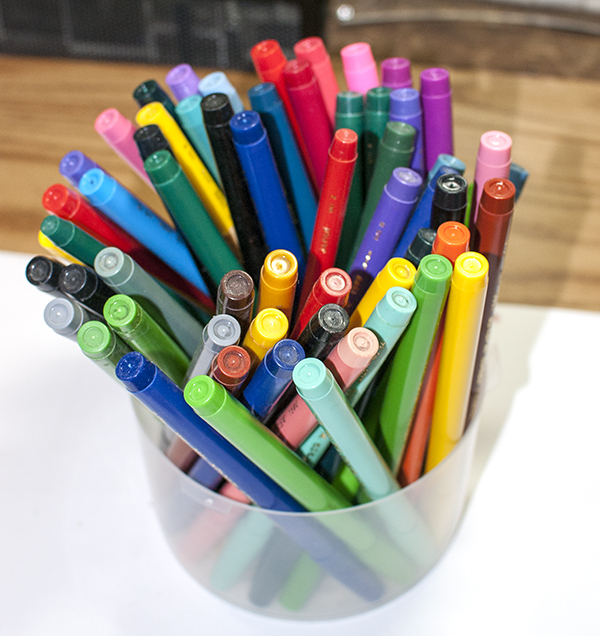 Well, you know me, I would rather spend my $$ on supplies and not storage:) Great post Nancie! Another use for the slotted plastic containers fruits come in – turn spools of ribbon on their sides and thread the end through the slot – makes it easy to pull out as little or as much as needed. WOW – more tips for saving things. 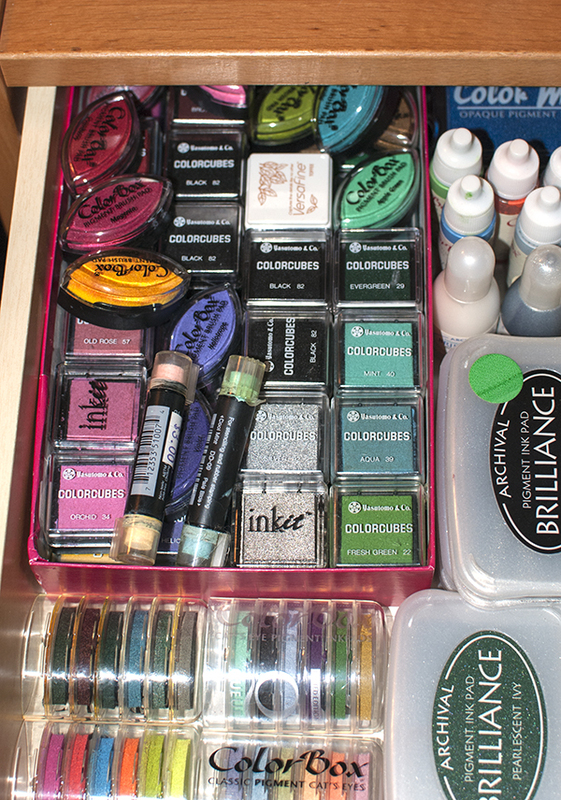 I do watercolor painting, and I got a 4xday pill box (28 compartments) I now have all my watercolor paints in small cubicles. You only have to open the color you are using, and all the others stay moist. I painted a small swatch on top of each opening. I store all my unmounted stamps in CD cases, with printed images of contents glued to the top cover. Oh, yes, and empty prescription plastic bottles make great storage for embellishments, etc. Thanks for sharing. I also save cereal boxes, cut the sides to size and use for mailing cards that need protection in the mail. AND the waxed paper inside is good for using with Spellbinders intricate dies to be able to get them out of the die easily. Great ideas Nancie…use almost all of them and know they work well. 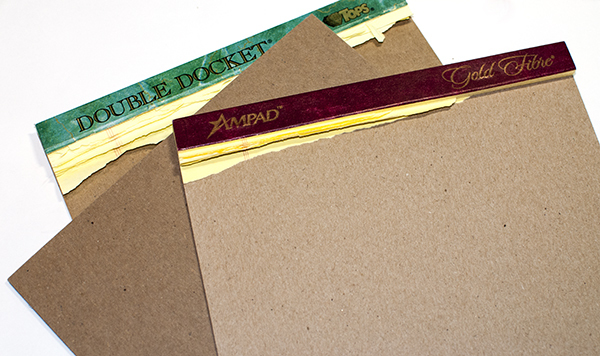 I also like to scour the Mission Store and Thrift Shops for storage – like Rubbermaid dividers that hook together. I can usually get them for 10 cents so feel it is a good buy! They are uniform and fit well in all my drawers – kitchen – sock – office – bathroom – bedroom – studio…and the list goes on and on! Even got two huge Rubbermaid lazy susans that fit in my corner cabinet under my desk…you know the kind – bottomless corner that you have to stand on your head to find anything…well, these two lazy susans, one per shelf, make it easy for me to actually see what is stored there and roll it around until I get what I want….lots of my EK punches are there, as well as envelopes I use all the time (in a few of the Rubbermaid dividers). Boxes, jars, etc. are a must if I want to find things I craft with! Hi Jan, I have a corner cabinet in my kitchen that is like that — so deep that things get sucked into the cabinet and never seem to come out. I’ve sometimes contemplated a Lazy Susan for that before . . . hmmm.